Nestled in a very unassuming side street in the Shirokanedai neighborhood, Horikane’s excellent cuisine is anything but modest. 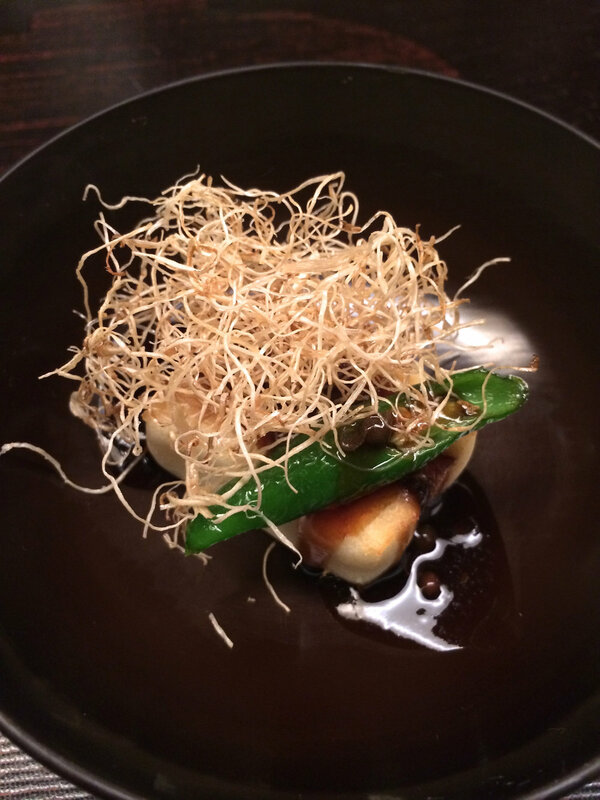 The Michelin guide stated that “Owner-chef Hidehiro Horiuchi’s kitchen is a place of focused concentration”. The interior of this tiny restaurant may be a little dated but the brilliance of Horikane’s dishes are anything but obsolete. Chef Horiuchi combines Japanese with chinese style and here are the series of exquisitely crafted dishes I was privileged enough to try. 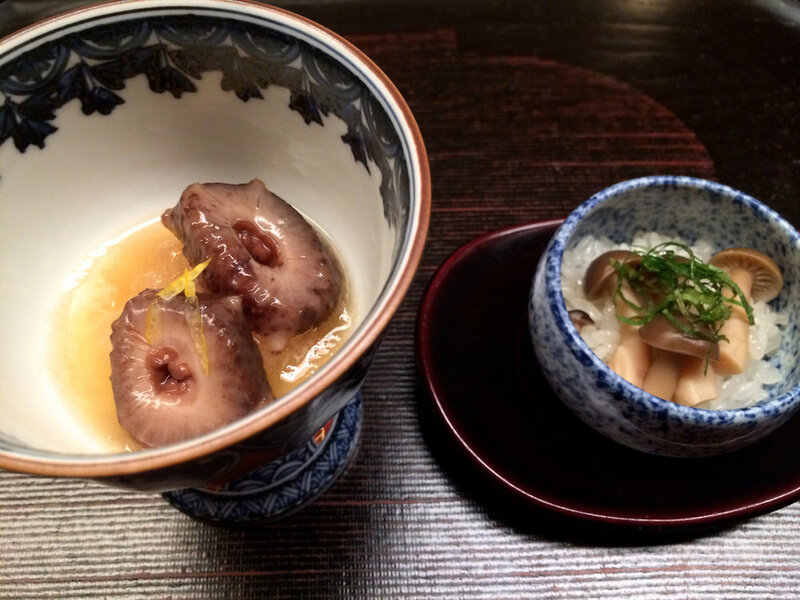 I wish I could have asked what the dish on the right was but my limited Japanese skills couldn’t figure it out. The next dish was my absolute favorite. Not only was it extremely creative it was also highly delectable, a thick shark fin soup in a mango fruit. You were asked to eat it like you would a coconut. Scraping the mango flesh and eating it with the soup. Heavenly. Next came three slices of the freshest fatty tuna (toro) with an array of condiments. 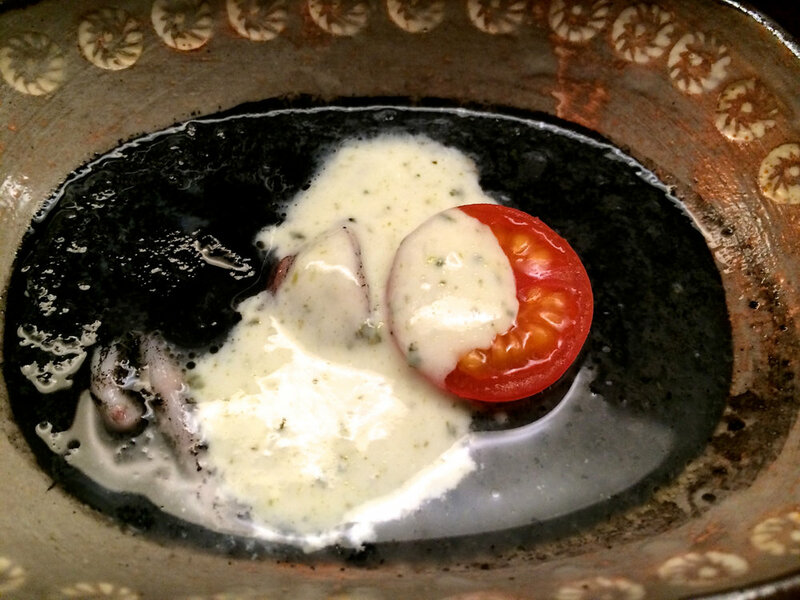 Following the tuna, came a squid dish bathed in black squid ink. Next came what I thought was a tofu dish but actually wasn’t. Once again, limited Japanese language skills hindered me from finding out what it was but at least I can show you how it looked like. 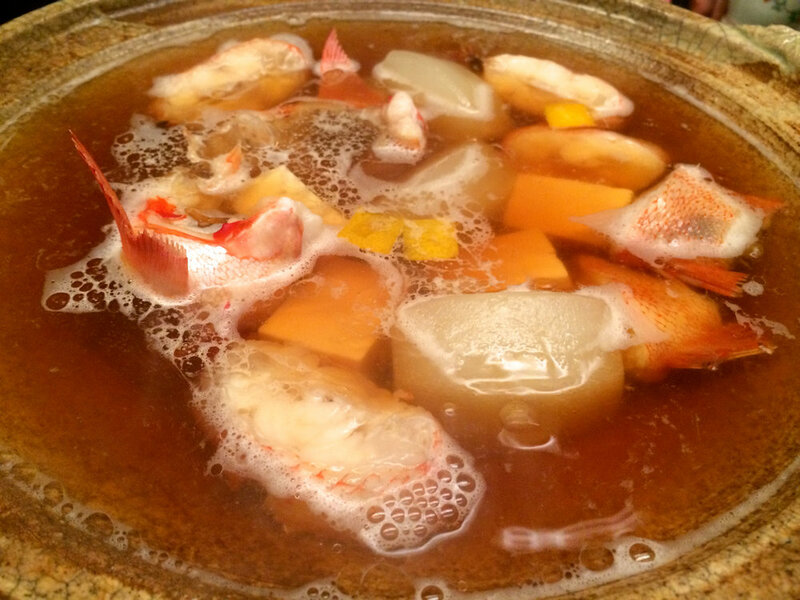 And as the main course we were served Horikane’s famous hot pot with chunks of vegetables and delicious fish inside. Then came a wonderful truffle scented rice porridge with poached eggs. Comfort food for my tummy. And to end things on a sweet note. Some lovely strawberries in a sesame sauce. I truly loved my meal. It would set you can around 25.000 to 30.000 yen but is absolutely worth it.